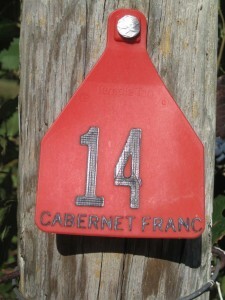 We’ve been pretty sure for a while now that Cabernet Franc was a good bet for our small vineyard. It’s a wonderful grape for blending, often used to soften the harsh tannins in its close cousin, Cabernet Sauvignon, and it is lovely on its own as a varietal. And we’ve tasted it at enough wineries in enough different parts of the state to believe that it’s well suited to the growing conditions found in Virginia. For those of you willing to spend upwards of $1,000 a bottle (and more) on a Cheval Blanc, I have no doubt you will feel the money well spent. But if you do, then don’t hesitate to invite me to share it with you. I’ve never tasted Cheval Blanc, but I’ve certainly lusted over the thought. However, if you are among the 99 – make that the 99.9 – who can’t afford Cheval Blanc, you should think about a Virginia wine that is either entirely Cab Franc or included as the dominant grape in a blend. Almost every winery in Virginia seems to have a Cab Franc in its tasting room, and many of them are splendid. But while we’re sold on Cab Franc, it’s always nice to hear that others feel the same way. In the Nov. 15 issue of The Wine Spectator, a lengthy article on Tim Mondavi includes a sidebar (The Francophile in Continuum,) that highlights this great winemaker's love for Cab Franc. "The wines that had the highest percentage of Cabernet Franc were the wines I loved the most," says Tim. "When I would be looking at the wines in barrel, I found there was a higher perfume [in Franc] that was very different from Cabernet Sauvignon. It also adds viscosity and suppleness you can't find with Cabernet Sauvignon or Merlot." That’s precisely the problem that some identify in Virgina reds – vegetal flavors, usually produced by a compound known as methoxypyrazine that comes from grapes that are not quite ripe. The risk is especially pronounced in areas with short growing seasons or in years when rain or other conditions force an early harvest. Done right, Cab Franc can be wonderful, in Virginia wines as well as in Mondavi’s Continuum. In another four years, after the vines have matured, the grapes have been picked and fermented, and the wine has been in the bottle for a suitable period of time, I’ll be able to tell you how well it worked out.